Home / News Releases / New Plant-Based Products! … Improved Packaging! … New Machinery! … National Distribution in Canada! 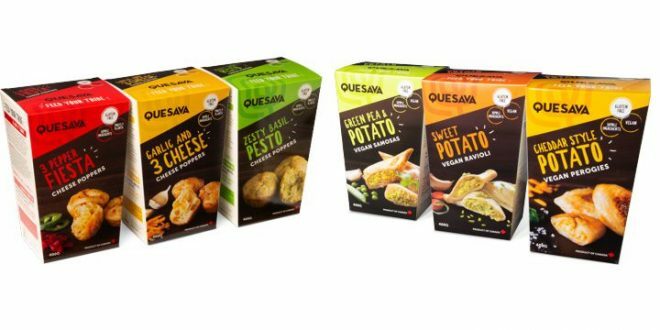 QUESAVA is expanding to national distribution in Canada on the strength of New Plant-Based, Gluten-Free Pockets – Samosas, Perogies and Ravioli and the already popular Mostly-Plants Cheese Poppers all in New Packaging designed for 6 SKU Block Merchandising! • Six Hero SKU’s the focus of expansion … Plant-Based Pockets and Mostly-Plants Cheese Poppers now in the same size 400-gram box creating a 6 SKU Merchandise Block in the freezer. • Three Plant-Based Pockets are; Cheddar Style Potato Perogies using Plant-Based cheese (Daiya’s Cheddar Style Shreds), Green Pea Potato Samosa and Sweet Potato Ravioli. • Three Mostly-Plants Cheese Poppers are; 3 Cheese Garlic & Onion, 3 Pepper Fiesta and Zesty Basil Pesto. Available for Retail Grocery through Horizon Distributors, Summit Specialty Foods, and Jon Luca. Available for Food Service direct from manufacturer. Contact info@quesava.com for images and detailed information.